You'll be £14.99 closer to your next £10.00 credit when you purchase The Rise of Hitler. What's this? In 1945, amidst the ruins of a bomb damaged German home, a tattered book Deutschland Erwache (roughly translated, ‘Germany wakes’) was recovered as a souvenir by a British soldier. 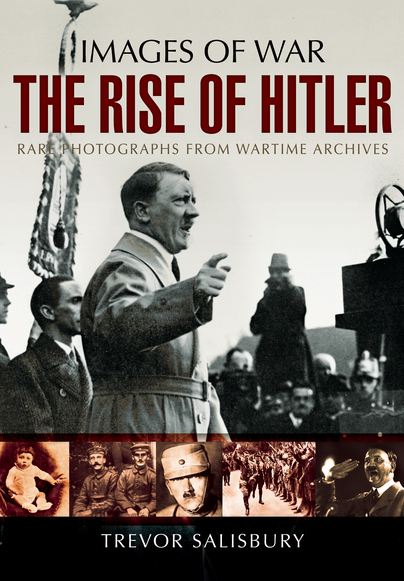 This primary source now forms the basis for this present title in the Images of War series, which in turn is a photographic record of Hitler’s rise to power from when he was born in 1889, as he took over the hearts and minds of the German people to his emergence as their leader. The original book was typical of the propaganda of the time, with non-critical acceptance of everything Hitler was and stood for, presenting him as a peace loving man who wanted a quiet life in the mountains. The truth was, as is now known, somewhat different. When found, the original book was in a poor state, but Mr Salisbury has translated sections of the original text as well as the photograph captions, in addition to going to some effort to salvage a selection of the images it contained, with the result, presented here, of providing the reader with a new and fresh pictorial perspective on Hitler’s control of Germany. This books fits very nicely with "With Hitler in the West", when the dominance achieved by Hitler in peace was translated into superiority in war, cementing the peacetime expansion of Germany under the Nazis. There is a very good selection if images and adequate text in their support. The photo essay with appeal to all those with an interest in the greatest global conflict. Most recommended. The original German captions are still present with their English translations underneath so it makes for clear reading and understanding. It highlights some very interesting aspects of Hitler as a political animal and a master manipulator...A fabulously revealing period piece, ending ominously with images taken just before the outbreak of World War II when Hitler, 'the man of the people', took his people to the brink of destruction.